Grip placed centrally in the vertical plane of the bow, to hugely alter the balance of the bow above and below the grip and give radically improved aim. Design hugely reduces pin movement keeping you steadier on the target. 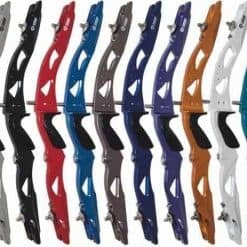 Changed weight distribution, with more weight of the bow below the grip, making the bow easier to control. Available in selected draw lengths as standard. For other draw lengths buy the correct module.